If you are drinking bottled water you will probably not have any concerns, except perhaps the cost. Well the next great thing in the household water revolution is here. Most industry experts agree that exotic bottled water, water coolers, jug filters and one-faucet filters are yesterday's news. Now you can enjoy crystal clear, safer water from every faucet in the home. With the help of the Homespring Central Water Purifier, pure tasting, safer water couldn't be easier. Most water treatment systems on the market take up space underneath the sink, in the refrigerator or on the countertop. They require constant monitoring, frequent replacement and provide water of questionable purity. These systems are inconvenient to use and provide a limited supply of water to the home, usually through one special tap in the kitchen. The Homespring Central Water Purifier, designed and manufactured by ZENON Membrane Solutions, enables the homeowner to obtain safer, better tasting water from every tap in the entire house by filtering water at the point of entry. In addition to providing an effective barrier to bacteria, parasites and viruses (please see certification and testing data for more information), this self-contained water treatment system, will distribute refreshing, crystal clear water to every tap in the home. Furthermore, a Homespring Central Water Purifier can yield additional cost savings to the homeowner by eliminating the need for bottled water and the costs of maintaining kitchen-based water treatment systems. Finally, homeowners can enjoy peace of mind and take water quality for granted with the convenience of a Homespring Central Water Purifier. The Homespring Central Water Purifier is made by ZENON Membrane Solutions, the world's leading provider of ultrafiltration membrane systems, currently recognized as the most advanced water treatment technology desired by municipalities and industries around the world. The Homespring Central Water Purifier uses thousands of ZENON's ultrafiltration hollow fibre membrane strands. Each membrane strand contains billions of microscopic pores. Household water pressure pushes water molecules through these pores towards the hollow center of the membrane, while blocking out larger contaminants such as bacteria, parasites and viruses (please see certification and testing data for more information). 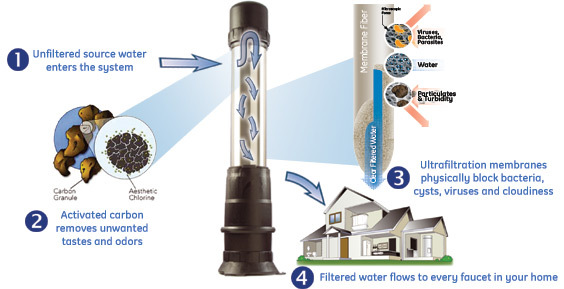 Filtered water then flows through each fibre and is distributed to every household fixture. Unwanted particles and micro-organisms are then flushed out of the System during the automatic cleaning cycle. Due to the small pore size, particles that are too large to pass through are physically blocked out, while dissolved salts and essential minerals freely pass through. The Homespring Central Water Purifier effectively blocks and removes particles larger than 0.02 microns nominal from your water supply.